A large number of people followed the EuroBasket and the 2015 Rugby World Cup in France, through various forms of media. When these international competitions occur, the number of sports-related searches greatly increases. The sport newspaper, L’Équipe gives a unique and great coverage of sports to its readers, but can not always answer people’s questions. We asked ourselves how we could use Google’s searches to bring a new dimension to L’Equipe. 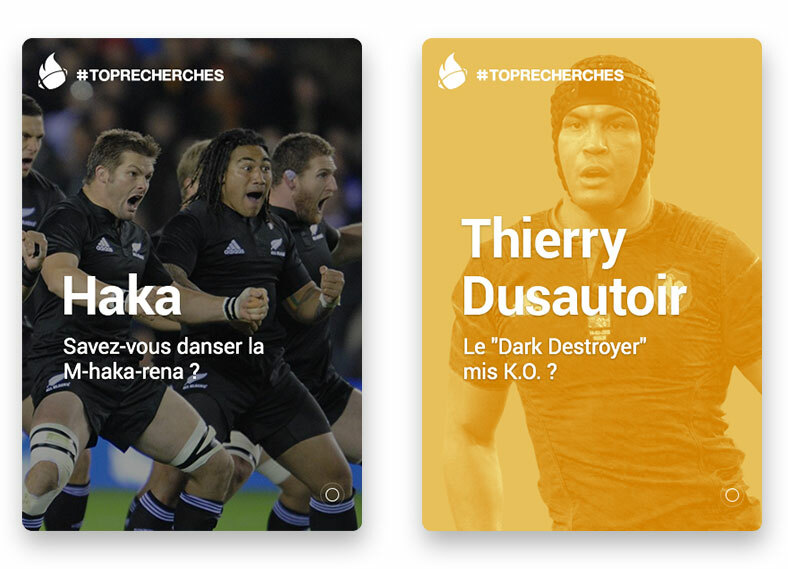 Using Google Trends and the editorial content of L’Équipe, we created Toprecherches. Bringing exclusive content, related to peoples’ searches. We’ve created fully animated digital trade cards with compelling animated illustrations, engaging facts and more so users can delve into the EuroBasket and the 2015 Rugby World Cup. For every trending topic about the competitions, a digital trading card was created. These cards all lived on the Toprecherches platform, allowing anyone to share them on social, blogs and newspapers. With the use of WebGL we were able to create smart and beautiful animations using the gyroscope function in 3D, allowing users to truly get the feeling of tradings cards. The design of the cards and the platform is rooted both in the first panini trading cards of the 70’s and in the current material design trends so that users can rediscover the feeling of trading cards adapted digitally with the modern touch of Google. 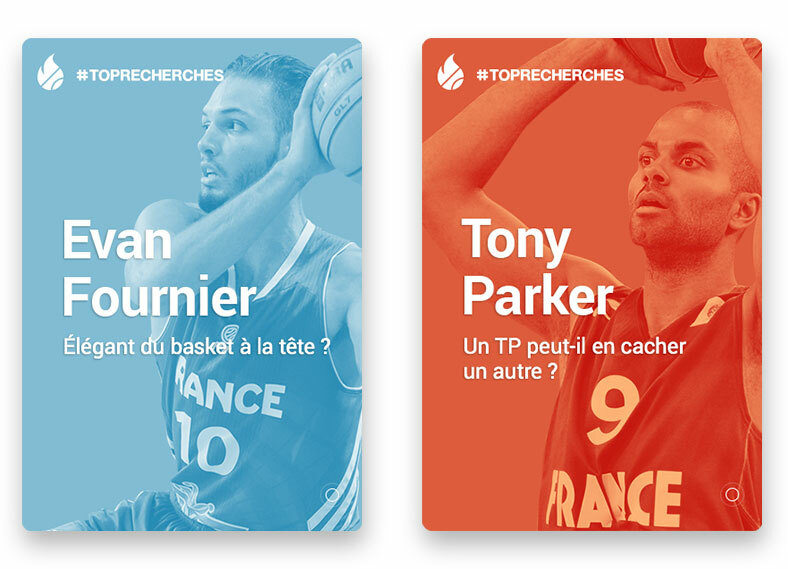 The biggest challenge of this project was to find a light format while including meaningful information which were attractive features to L’Équipe articles, so journalists would frequently use the cards in order to give their readers unexpected content. The social aspect of the campaign made it reach millions of people, and a huge number of views across L’Équipe website and the Toprecherches platform.